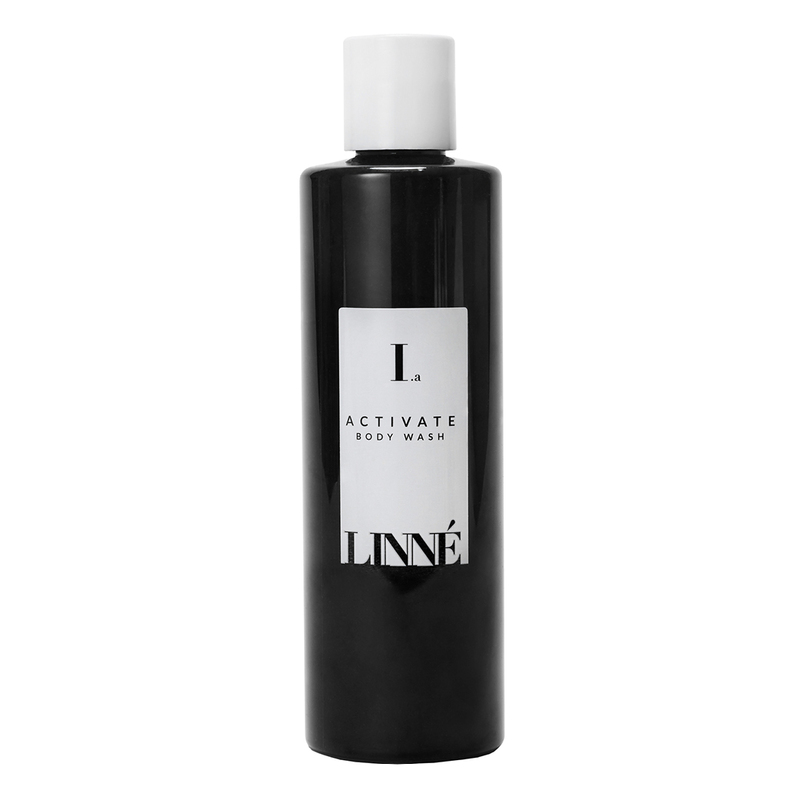 LINNÉ'S Activate Body Wash is crafted with natural elements that bring a feeling of balance to oily skin and offer antibacterial, anti-inflammatory and antiseptic constituents. It is rich in minerals, ultra-gentle and made from organic, wild-harvested, and EcoCertified ingredients. Activate Body Wash gives off the invigorating aromas of Eucalyptus, Vetiver, Douglas Fir: Damp Woods, Resin, and Camphor - which work to boost a sense of mental alertness while promoting a feeling of relaxation and tranquility. Massage ACTIVATE into damp skin to cleanse, and promote a smooth and nourished feel. Use circular, upward motions starting with the extremities and moving toward the heart to improve the look of circulation. This a concentrated, nutrient dense product, and while it may be used daily, it is also recommended as a special weekly treatment. The content of eucalyptus essential oil offers a decongesting quality to the respiratory system making it a welcome addition to warm baths and steamy showers during cold and allergy season. Natural separation may occur; shake before use. The refreshing scent and lightly exfoliating texture are really lovely. I like the result of the wash on my skin - but have found it's not worth the aggravation of the overall experience. As others have noted, the choice of a bottle with small squirt top is not the right choice of packaging - the product is clumpy in texture and I had to unscrew the top and squeeze right from the bottle, which was still hard to do. So the packaging is a total fail (it needed to be in a jar like a body polish, not a wash). Secondly, the mess left in the shower makes this product not worth using in my mind. If you have an all tile/glass shower it might not be too much of a problem to scrub down after using the product, however I have a shower curtain with a fabric liner, and this product stains the liner. I have to scrub any drops of foam that landed on the liner off after each time I used this product, and I still have light gray stains on my curtain. This product would be nice to use in a spa setting, where I'm not responsible for the mess/cleaning after using! This is a gentle, charcoal body scrub with a menthol-herbal fragrance that helped alleviate my KP; unfortunately, as other reviewers also noted, it made a mess of the shower. I have a shower-tub combo, and while the charcoal easily rinsed off, there was an ashy grit residue that would not lasted even after a thorough tub scrubbing. I gave up using before getting halfway through the bottle and will not consider purchasing again. A charcoal wash is appealing to me, but I did not enjoy this product. It was thin and non sudsing and felt it had zero cleansing ability. It did make a huge mess in the shower. Packaging for this and the face wash is cheap and non efficient for the product. I really enjoyed the scent of this (which primarily reminded me of black licorice), and it was a nice texture and didn't dry out my skin. Unfortunately, the charcoal made a mess of the shower, and ultimately was enough of a nuisance to prevent me from buying this again.